​The Motion Picture Association of America (MPAA), Hollywood’s top trade group, isn’t only targeting movie pirates anymore. A Minneapolis-based brewery says it had to change the name of its “Rated R” beer after being approached by the association. Robert Kasak, the co-founder of 612Brew in Minneapolis, Minnesota, recently told reporters that the company changed the name of the ale to “Unrated” after receiving a letter from the MPAA. "[Our beer] could have been PG, PG-13 or R," Kasak told Business Journal. "It didn't matter. As long as it contained the word 'rated' it would still get flagged." TorrentFreak, a website that regularly covers the routine MPAA-launched lawsuits against alleged movie pirates and file-sharers, notes that the trade group registered “Rated R,” “Rated PG-13” and other brandings back in 1986 when the group revealed new categories for its nationwide film rating system. When 612Brew attempted to trademark the names of its beverages a few months ago, the MPAA intervened and sent the beer makers an official notice, the Business Journal reported. Kasak and company then tried to argue that major differences between the beer business and the movie industry should make the trade group’s claims moot, but MPAA executives disagreed. Although a copy of the cease-and-desist warning has not been made available, MPAA spokesperson Kate Bedingfield confirmed to the Business Journal that the group did, in fact, send such a letter to 612Brew. The “Rated R” beer officially became “Unrated” as of January 1, 2015. "It's going to take some time for people to get used to it, but it will be OK," Kasak told the paper. "It's a great beer and they'll drink it regardless of the name." “This Rye IPA greets you with a burst of citrus hop aroma and tempts you with the spice from the rye. 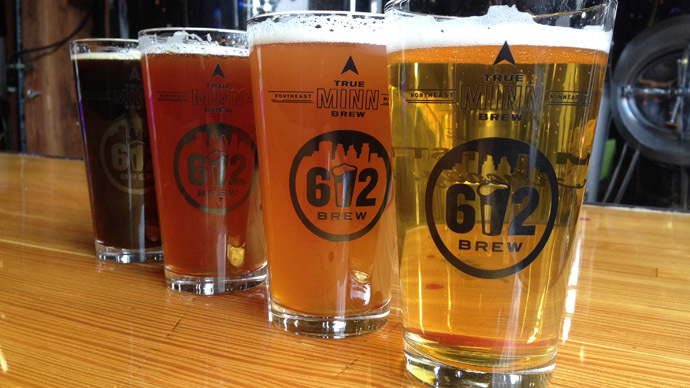 612Brew’s most full-bodied and hoppy beer, yet easy enough that your mom would like it. If your mom is awesome,” the 612Brew website reads.